Senior Organising Secretary of the Georgetown Dominoes Association Mark Wiltshire has gained the backing of Medi Care Pharmacy for the staging of his birth anniversary dominoes competition which is set to commence on January 13 at Turning Point Sport bar. 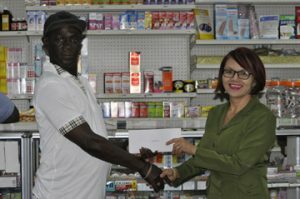 The entity’s supervisor Susan Chan yesterday handed over a cheque to Wiltshire at their Hinck Street, Georgetown location. Chan expressed gratitude to be part of the tournament and said she is looking forward to an exciting and successful one. She added that Medi Care has always been supportive of sports and they are happy to give back to the society especially through sports. Chan stated that she is happy to learn that some of the top teams in the sport will be competing, adding that they too will be fielding a side. Mark Wiltshire accepts the cheque from Susan Chan. Wiltshire thanked the entity for their support and is urging teams to register soonest. Among the teams slated to take part are Medi Care, Mix Up, All Season’s Racing Service, Spartans, Gold for Money, Turning Point, C7, C6, Phantom, Beacons, Providence, Saddam, Strikers, Rage, Big Boss Trucking Service, Orange Walk, Good Times, Thunder, Bartica, Essequibo, Transport SC and Players. Entrance fee is $15,000 and apart from the trophy and medals, the winning team will take home $175,000. The runner-up will pocket a trophy and $75,000, third place a trophy and $35,000 and fourth place a trophy and $20,000. The MVP in the final will take home $10,000, while the best female player in the tournament will pocket $10,000. Action gets underway at 14:00hrs. Teams can contact Wiltshire on 665-5855 for registration.